4. Creation of a new monetary system, including the establishment of a Currency Board in April 1991. Disinflation was gradual, with inflation falling from 1,344 percent in 1990, 84 percent in 1991. In the 1992 currency reform, 1 new peso was exchanged for 10,000 australes. The overall impact of hyperinflation: 1 new peso = 100,000,000,000 pre-1983 pesos. The inflation rate for 1992 was 17.5 percent, 7.4 percent in 1993, 3.9 percent in 1994 and 1.6 percent in 1995. By 1995, government expenditure represented 27 percent of Argentina’s GDP. For most of the early part of then 20th century, Brazil’s money was called Reis, meaning “kings”. By the 1930s the standard denomination was Mil Reis meaning a thousand kings. By 1942 the currency that devalued so much that the Vargas government instituted a monetary reform, changing the currency to cruzeiros (crosses) at a value of 1000 to 1. In 1967 the cruzeiro was renamed to cruzeiro novo (new cruzeiro), and three zeros were dropped from all denominations. In 1970 the cruzeiro novo was renamed, dropping the “novo” and once again being called simply the cruzeiro. During the 1970’s while the Brazilian economy was growing at 10% a year, inflation was running anywhere between 15 to 300%. 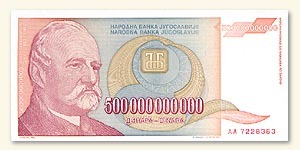 500,000 Brazilian Cruzeiro bank note. 3. Wages were frozen and a new currency — the real — was introduced as part of measures to de-index the economy. Beginning in 1971, during the presidency of Salvador Allende, Chilean inflation began to rise and reached peaks of 508% in 1973. 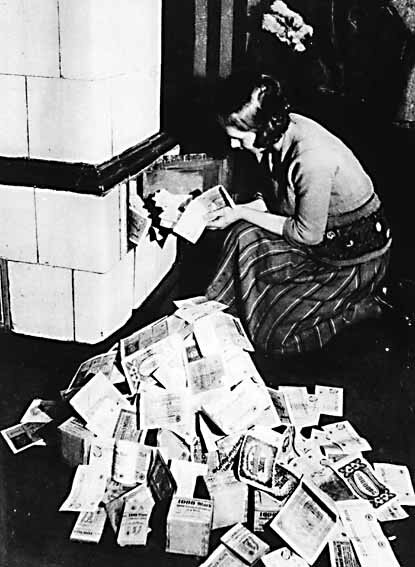 As a result of the hyperinflation, food became scarce and overpriced. The economic and social troubles culminated in the 1973 coup d’état that deposed the democratically-elected Allende and installed a military government led by Augusto Pinochet. Under Henry I, the quality of England’s silver coins fall dramatically. In 1124, the right hands of the mint masters were cut off causing a temporary improvement in the quality. Henry II reformed the English coinage in 1158 thereby restoring the prestige of English money which was maintained for the next three centuries. Henry VIII debased the coinage of England as a means of raising revenue from 1543 to 1551 in what is known as the “Great Debasement”. In 1560, Elizabeth I and her advisors, foremost among them being Sir Thomas Gresham (of Gresham’s Law) brought about stability by establishing the pound sterling and began to recall the earlier debased coinage and reminting them to remove the base metal component. The pound sterling was valued as one troy pound of high purity sterling silver. In 1696 England’s silver coins, many of which are worn or clipped, were replaced with new. Full-weight silver coins. France did not start using paper notes until much later than other European nations due in part to the Mississippi Company debacle of 1719-1720. In the spring of 1789 the French Assemblee decreed the issuance of 400 million paper livres, known as assignats, secured by the properties that had been confiscated from the Church during the revolution. 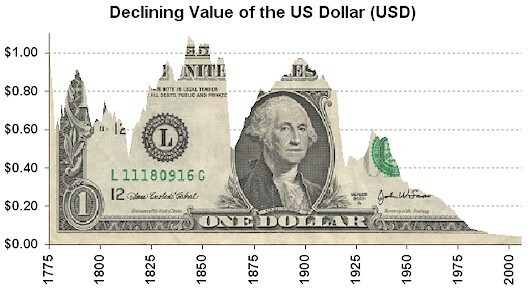 Over the following years, the Assemblee continued issuing greater quantities of assignats and in addition to price controls, dictated a death sentence on anyone selling the notes at a discount to gold and silver livres. 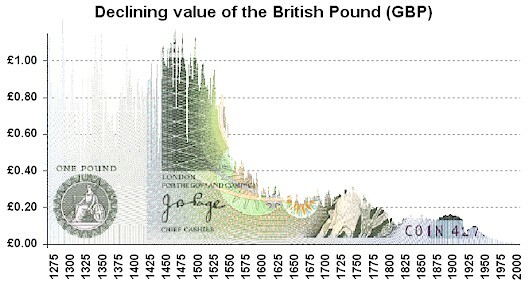 By late-1795 the amount had reached 40 billion and a new currency was issued, the mandat, which promptly lost 97% of its value over the next two years. In 1797, both paper currencies were recalled and a new monetary system based upon gold was instituted. France also suffered through a long period of moderate inflation from 1944 to 1960. Some countries ease off on Germany’s war reparation burden and a new interim currency, the Rentenmark, secured on mortgages on land and industrial property restored stability. In 1924, the Reichmark, replaces the Rentenmark and has an equivalent to the pre-war gold mark. Japan first began printing paper money in the early part of the 14th century but was short lived. In more recent times, Japan experienced post-WWII hyperinflation in which consumer prices rose by 5,300%. There is also the issuance of military yen (also known as banana money) to soldiers of both the Imperial Japanese Army and Navy. This currency was first issued during the Russo-Japanese War of 1904 and reached a crescendo during the Pacific War. During this time, military yen was forced upon the local population of occupied territories. Military yen was printed without regard for inflation, unbacked by gold and could not be exchanged for Japanese yen. When the Japanese occupied Hong Kong, military yen was forcibly exchanged with Hong Kong dollars at a ratio of 1 to 2. Anyone caught with Hong Kong dollar was to be tortured. After the exchange, the Japanese military purchased supplies and strategic goods from the neutral Portuguese port of Macau using Hong Kong dollars. On 6 September 1945, the Japanese Ministry of Finance announced that all military yen became void thereby leaving overseas holder of military yen with pieces of worthless paper. The Madagascan franc lost nearly half its value in 2004. On 1 January 2005 the Madagascan ariary replaced the previous currency at a rate of 1 ariary for five Madagascan francs. In May 2005 there were riots over rising inflation suggesting the situation wasn’t over. Mexico defaulted on its external debt in 1982, and experienced several years of inflation. On 1 January 1993, the Bank of Mexico introduced a new currency, the nuevo peso which was equal to 1,000 old pesos. Since the Mexico Peso Crisis of 1994 the value of the Mexico peso has plummeted by almost 60%. The government contends that the devaluation was necessary to decrease the account deficit. Genghis Khan’s empire went through two hyperinflationary periods. Kublai Khan, the grandson of Genghis and then emperor of China, circulated paper money to replace that of the Chinese provincial governments. This currency was known as The First Mongol Issue. It depreciated rapidly after its short-lived success from 1260 to 1263. Currency reform occurred in 1264, and The Second Mongol Issue, equally irredeemable, and unlimited in issue, replaced the earlier notes at a ratio of 1:5. This currency lasted for 1290 at which time it began falling in value till about 1310. It was replaced by a third issue at the same ratio of 1:5. Over-issue of these notes once again destroyed their value. During the final phase of the Mongol Dynasty in around 1350 huge efforts were unsuccessful in fixing the monetary situation. The usurping Ming Dynasty issued yet more paper currency with the solemn legend “This paper money shall have currency, and be used in all respects as if it were copper money”. There was no public confidence in the firmness of this declaration and at the outset the paper traded at 17:13 against copper coinage. Before long the ratio fell to 300:1. This changed during the Second Punic War. Hannibal and his legendary elephants conquered from Carthage in North America, through silver rich Spain, to the Roman copper mines in northern Italy (modern-day Tuscany) and threatened Rome from the north. In response, the Romans began to over-issue underweight and overvalued coinage to finance the massive military effort which was required to repulse the enemy. What came out afterwards was a very different Rome. It was much more militarist and expansionist in order to support its large military. Within 100 years Rome’s republican politics had subsided into what was effectively dictatorship. In the words of Del Mar in his History of Monetary Systems, “for nearly two centuries, during which all that was admirable of Roman civilization saw its origin, its growth and its maturity. When the system fell Rome had lost its liberties. The state was to grow yet more powerful and dreaded, but that state and its people were no longer one.” The former republic of Rome descended into essentially what was serfdom. 1,000,000 lira banknote, issued by Turkey. The United States has experienced two currency collapses. The first was the Continental Currency (“Not worth a Continental”) the American colonists used to finance the Revolutionary War. 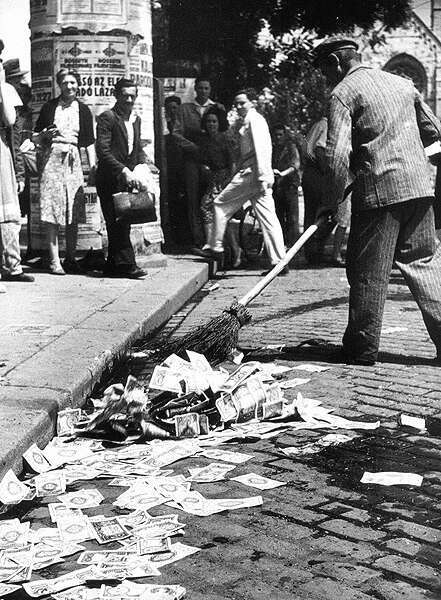 While the Americans won their independence, their currency was destroyed in the process. The second were the Confederation notes. In an effort to finance the civil war with the north, the Confederate States of America issued vast amounts of money. At one point, the Secretary of the Treasury recommended that counterfeit money be utilized. Anyone holding a counterfeit bill was to exchange it for a government bond. The government would then stamp it “valid” and spend it. The island of Yap in the Pacific Ocean used varying sized stones as money, of which the largest weighing several tons were the most valuable. The stones had been brought by sea from the Island of Palau 210 km away. The journey was very perilous given the length of the voyage and the rough seas between the islands of Palau and Yap. Many of the stones were lost at sea. The risk associated with procurement of the “money stones” initially made them highly valuable. 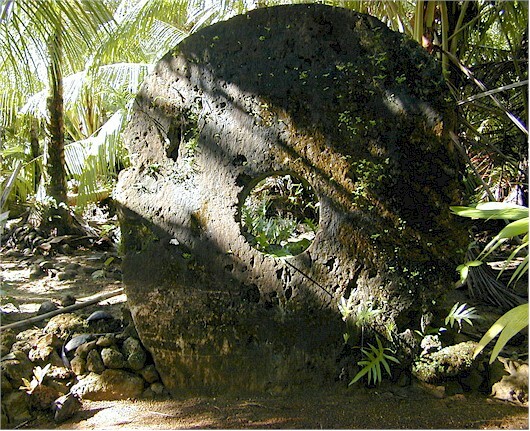 The Yapese valued them because large stones were quite difficult to steal and were in relatively short supply. However, in 1874, an enterprising Irishman named David O’Keefe hit upon the idea of employing the Yapese to import more “money” in the form of shiploads of large stones, also from Palau. O’Keefe then traded these stones with the Yapese for other commodities such as sea cucumbers and copra. Over time, the Yapese brought thousands of new stones to the island, debasing the value of the old ones. Today they are almost worthless, except as a tourist curiosity. 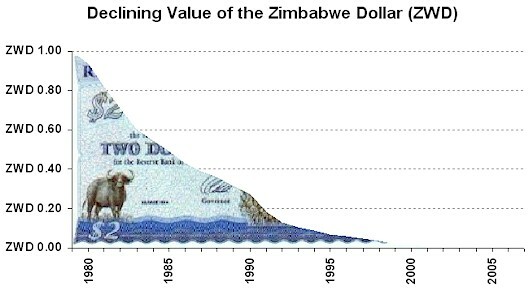 the final result of hyperinflation. The Rhodesian dollar (R$), adopted in 1970, following decimalization and the replacement of the pound as the currency, was set at a rate of 2 Rhodesian dollars = 1 pound (R$ 0.71 = USD $1.00). At the time of independence in 1980, one Zimbabwean dollar (of 100 cents) was worth US$1.50. Since then, rampant inflation and the collapse of the economy have severely devalued the currency, with many organizations using the US dollar instead. Mike Hewitt is the editor of http://www.DollarDaze.org, a website pertaining to commentary on the instability of the global fiat monetary system and investment strategies on mining companies. Disclaimer: The opinions expressed above are not intended to be taken as investment advice. It is to be taken as opinion only and I encourage you to complete your own due diligence when making an investment decision.